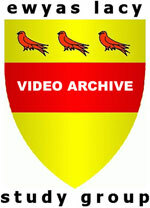 Video Archive clip by ‘GwynThomasWales’, made for television in the 1960s. The video includes a narrative soundtrack describing the history, context and lifestyle relating to the monastic houses in the Vale of Ewyas. In the 1960's writer and broadcaster Gwyn Thomas made a series of programmes for TWW in which he visited different parts of Wales. In this programme, Gwyn visits the two Abbeys of Llanthony. Today, his unique, warm and darkly humorous observations give us a fascinating insight into what life was like for people living in these Welsh communities over 40 years ago.